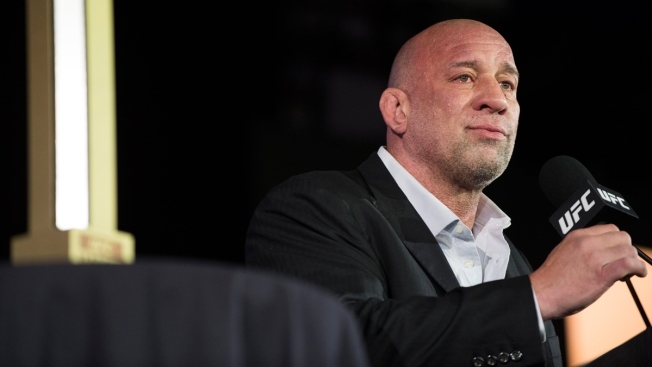 Mark Coleman said in a press release that his previous comments "were not accurate"
In this July 10, 2016, file photo, Mark Coleman speaks as he is inducted into the UFC Hall of Fame at the Las Vegas Convention Center in Las Vegas, Nevada. A conservative group that has been defending Rep. Jim Jordan released a quote from a former Ohio State University wrestler on Thursday in which he appears to recant his claim that the congressman knew, as an assistant coach, that the wrestling team doctor was sexually abusing athletes, NBC News reported. Mark Coleman, a former UFC world champion, said in a press release supplied by Shirley & Banister Public Affairs that his previous comments "were not accurate." "At no time did I ever say or have any direct knowledge that Jim Jordan knew of Dr. Richard Strauss’ inappropriate behavior," Coleman said in the release. "I have nothing but respect for Jim Jordan as I have known him for more than 30 years and know him to be of impeccable character." Coleman could not be reached to corroborate the comment put forward by the conservative group. But it stands in contrast to what he told the Wall Street Journal on July 5 — two days after NBC News first reported allegations from three other wrestlers that Jordan had must have known about the alleged abuse by Strauss. One of the wrestlers even said that he talked to Jordan about the doctor's behavior.